Khalafova was inspired by pomegranate, known as Azerbaijan's national symbol. Pomegranate continues to be a motif often found in national fine arts and culture. The dresses in second collection were created from the unique Uzbek silks. 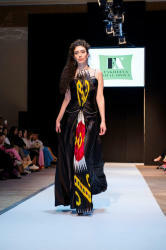 Brightness and ethnic motives of Uzbek fabrics inspired her for a new creative experiment. 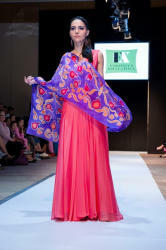 The traditional Uzbek fabrics made with the use of ikat technology have become extremely popular in fashion industry. 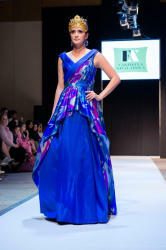 The runway show featured music performed national folk sings on balaban performed by acclaimed musician Alihan Samadov. Azerbaijan Fashion Week 2018 took place in Fairmont Baku Flame Towers on May 19. The runway show was timed to the 100th anniversary of the Azerbaijan Democratic Republic. The fashion show featured a series of fashion shows with the participation of such famous designers as Fakhriya Khalafova, Diana Ahadpur-Kengerli, as well as Alex Chzhen, Yerlan Zholdasbek, Makhaim, Mak Mari and many others who present new fashion collections Autumn- winter 2018/19. Besides fashion shows, AFW showrooms were available for the guests. Fashion lovers had a chance to talk with designers, learn about the latest fashion trends, discover new names and find something special for their wardrobe. 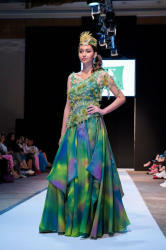 Azerbaijan Fashion Week is held twice a year: in May and November. The main goal is to popularize the growing fashion industry in Azerbaijan and create conditions for demonstrating the work of talented designers.